HHN at Universal Studios Orlando, FL. As someone who sells attraction tickets as an added value to the vacation rental homes I offer with my Florida Dream Homes business, I have access to a plethora of free tickets to almost any attraction in the Greater Orlando area. But I have to explain to my son that I can’t get free tickets to Halloween Horror Nights (HHN) at Universal Studios. As I hang up the phone, sorry to disappoint my son, I muse on the fact that I can’t get tickets. Last year, I paid full price for both my sons to enjoy a night at HHN. What is it about this event that makes it so widely successful that Universal does not feel a need to preview it for their off-site ticket sellers? Before I explore that question, let me tell you a little about HHN for those who are unfamiliar with the event. It takes place at one of the two Universal theme parks–This year it is at Universal Studios. It begins on September 26, and runs Friday, Saturday, and Sunday for the next six weekends. On these days, the theme park closes its doors early for the regular guests, then reopens them at 6:30pm for HHN when it will stay open until either midnight or 2am depending on the date. Inside the theme park, most of the major rides remain open. However, there are several additions that create that special HHN effect. 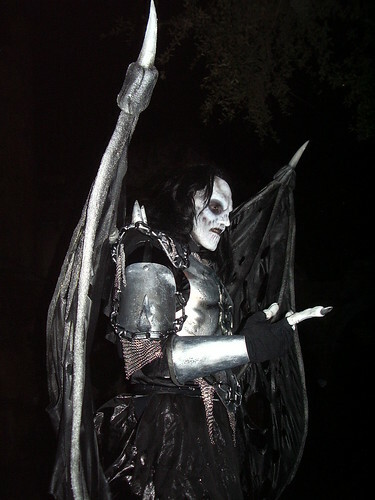 The theme park creates “scare zones” where low light levels, fog, and costumed characters lurk and jump out in an effort to create screams and terror. The usual theme park live shows are replaced with special HHN themed shows, and, best of all, several very creative and high tech haunted houses are created to be walked through by the guests. The entire event is usually themed around a specific scary story for that given year. HHN is not for the squeamish nor faint of heart. It is certainly not for small children. My 13 year old daughter is just getting to the point where she might feel comfortable (hmmm, perhaps that is not best expression to use) going to HHN. I have seen some youngsters, perhaps as old as eight or nine, enjoying the event, but I count them as the exception. Getting back to my original question, what makes HHN so successful? First, people really love Halloween. For example, at a private school that my wife and I helped to found, the yearly Halloween Haunted House was our biggest single fundraiser. I also recall a time, almost 30 years ago, when I was working at Rental World in Lansdale, PA. The owner of the store, Hal Kodikian, is one of the most astute businessmen I have ever had the honor of calling my friend. One year, he spent thousands and thousands of dollars purchasing Halloween costumes to rent. Since the Halloween season (back then) was less than two weeks long, I asked him why he was willing to risk such a large investment. “Because my friends in the business tell me it’s worthwhile,” he replied. A quick visit to his website confirms that Rental World is still renting costumes. Ironically, this morning I was watching The Hunchback of Notre Dame starring Charles Laughton. Part of the story revolves around the “Feast of Fools” an event that has a lot of similarities to Mardi Gras and our current customs regarding Halloween. In one scene, two of the characters have a conversation about the human nature that is both attracted to–And repelled by–the ugly, malformed, and suffering of others. Could it be that our nature is hardwired to be unable to resist the opportunity to run to the fire or gawk at the accident by the side of the road? Whatever the reason, there is no question that Hal Kodikian is correct when he says that Halloween sells. The Universal website warns that some HHN nights are complete sellouts. The Universal rep does not give away free tickets. The theme park is able to get two full admission prices on the same day–One from the regular guests who have to leave early and the second from the throngs who attend HHN. All of this attest to both the creative genius behind HHN and the reality that Halloween sells. HHN is in its 18th year at Universal Studios. They also offer it at their theme park in California. Both Sea World and Disney offer their version of Halloween events. Sea World has their “Spooktacular” and Disney has “Mickey’s Not So Scary Halloween Party.” The former invokes images of Shamu in a sheet and the latter seems geared towards two year olds. Frankly, I know nothing about either event, except that their very names make it unlikely for me to do any further research on them. In general, I like Disney much more than Universal or Sea World. But when it comes to Halloween, Universal seems to have gotten it just right. And, yes, it sells. Please enjoy HHN and post a comment here to let us know about your experiences. Enzian Theatre–Art House Theatre with Dinner! 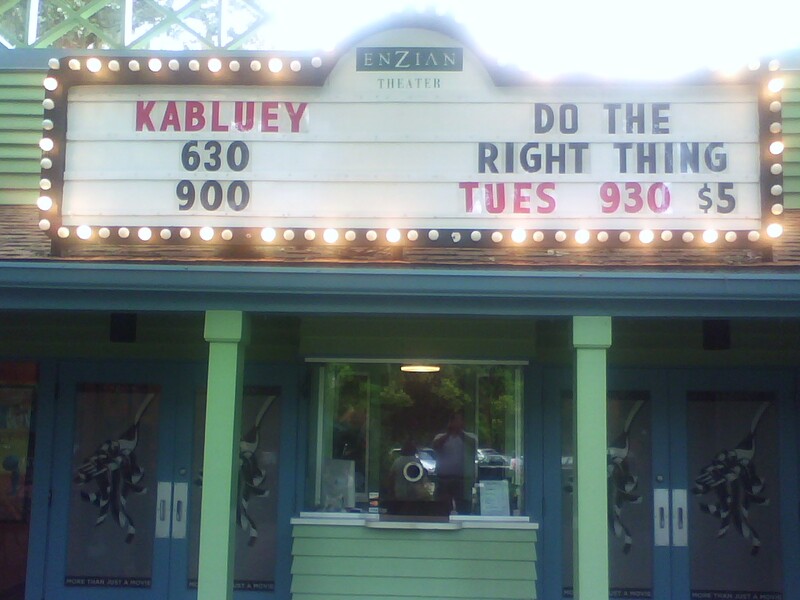 Just north of Orlando on the edge of Winter Park is a real hidden treasure–The Enzian Theatre. Enzian is an art house theatre that plays exceptional movies that you often don’t find at your local mega-theatre complex. In addition, Enzian sponsors a monthly free “popcorn flicks” movie at a park in Winter Park, the annual Florida Film Festival, various “cult classics” showings, a kid’s theatre camp each summer, and several other special events and minor film festivals. Your first impression of Enzian will confirm that you have arrived at someplace special. The gravel parking lot that weaves parking spaces around the old green building feels more like a private driveway than a commercial lot. The large green edifice itself has the look of an old, comfortable home that has been remodeled with a large addition and only the flashing marquee above the entrance hints that you are actually at a theatre. Yet it is the sound of gurgling water from the unobtrusive fountain engulfed by the canopy of a large, ancient oak tree covered with hanging Spanish moss in front of the theatre that puts you in the right frame of mind for a truly memorable evening. The newly constructed outdoor bar provides not only beverages, but local art newspapers, friendly and knowledgeable conversation, and a place to unwind either before or after the show. Upon entering the spacious lobby, you can pass the time by reviewing the displays of coming attractions or the decorations of old, favorite movie posters. When the house opens, be prepared to experience a theatre unlike any you have enjoyed before. There are four different levels of seating. The level closest to the stage and screen is made up primarily of large sofas with coffee tables and comfortable upholstered chairs with arm tables. The second and third levels feature two and four person tables with large semi-oval chairs that envelop you. The last level features additional table and chair arrangements allowing parties of any size to sit together and enjoy a meal and a show. As soon as the house opens, a large army of wait staff scurries through the theatre taking food and beverage orders. The constantly changing menu features top notch, creative fare to satisfy all palettes, including those with special diets such as vegetarians. Orders are automatically transmitted to the kitchen and at some point early on in the movie your meal will be skillfully and quietly placed at your table. 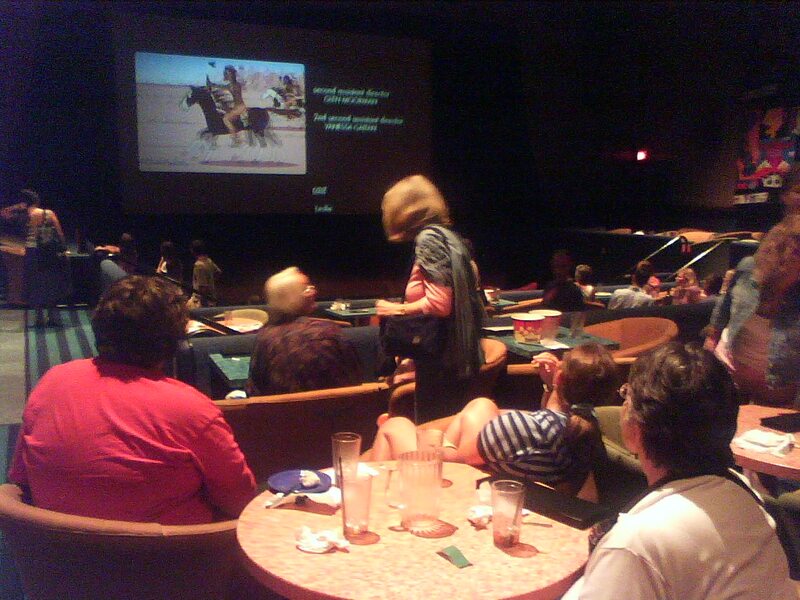 Although a visit to the Enzian is special at any time, in early spring the theatre comes alive with the annual Florida Film Festival. The festival is so large, several other theatre venues are used as well, but the best and main festival favorites all take place at the Enzian. Many times my two sons and I would spend an entire day at the Enzian enjoying a feature film here, a documentary there, a selection of shorts, and, of course, the midnight showing which was always more interesting to my sons than to me! I can’t imagine the logistical challenges of serving so many film goers movie after movie, yet I never failed to receive good food and good service while enjoying the many films. About 10 years ago when Disney gave my family comp tickets to see Cirque du Soleil’s newest show La Nouba at their Downtown Disney complex I had never heard of Cirque du Soleil and had no idea what to expect. I could not imagine how it was going to affect me. I now know that it is incorrect to say that one “sees” a Cirque du Soleil show. One “experiences” it. And if you are open to it, you might find that it has a profound effect upon you. In my lifetime, there have only been a handful of theatre experiences that have affected me so profoundly as did La Nouba. La Nouba has a permanent home in a theatre located in the Downtown Disney shopping and entertainment complex, right next to Disney Quest, House of Blues, and Wolfgang Puck’s Restaurant. The building is cleverly shaped to give the impression of a large circus tent complete with guide wires. Parking is convenient and free right next to the theatre. One website I visited said the theatre holds over 1600 seats. I would never have guessed it was that large. I have been to La Nouba several times and have sat in several different seats, from the front to the back and from the left to the center to the right. I can honestly say there is not a single bad seat in the house. In fact, the different seats have all presented a different view that allowed me to enjoy the show from a different perspective. It is not cheap. Tickets range in price from $52 to $115 as of 2008. The show lasts ninety minutes without an intermission. There are concession stands that sell drinks and food items, but don’t waste your time. This show puts you on the edge of your seat and you are constantly looking left to right, up and down. You don’t want anything in your hands that distracts you. The proscenium juts way out into the audience and the seats are curved around it, making every seat feel intimately close to the action. In addition, there is a long walkway between the lower and upper seating sections that is used during the performance to create an even closer experience regardless of your seat. Lastly, come early. There is a pre-show, audience participation act by two clowns that is not to be missed! As for the show itself, what can one say? Every now and then a piece of theatre comes along that is so new and so innovative that it defies conventional description. I will attempt to give some indication of the show. But I can’t do it justice. Just know that what I say with words can only be express in pictures, what you see in pictures can only be felt in person, and what you feel in person can only be experienced within your own heart. That, I believe, is the magic of La Nouba. It is a magic that is at once timeless yet very much in the moment. It is a magic that touches all ages. Your three year old will enjoy the show as much as you and you will enjoy the show as much as your grandmother. Overall, the show is a combination of circus-like acts performed by incredible athletes and acrobats in the most gorgeous and unique costumes highlighted by a live band and soloist playing soulfully esoteric music which enhances the visual experience. Very few words are spoken. Each acrobatic and athletic act is engulfed by moments of comedy, dance, or some other visual element most of which will be a new experience for you. The show begins with a pre-show where two clowns, dressed and performing in a classic Emmet Kelly-esque fashion, interact with the audience and a load of boxes. Then comes the opening march, where the most fantastically costumed people you have ever seen do a slow processional through the center of the audience–Each one walking in a unique way that creates a memorable character. This is an introduction to the characters that will grace your evening for the next ninety minutes. An entertaining, if not confusing, segment occurs next leaving you to wonder if you are watching a play, a surreal play, a dance, an opera, or simply something unintelligible. My advice to you at this point is to sit back and take it all in. Soon enough you’ll be grabbing the edge of your seat. Then comes one unbelievable act after another. There are tight rope walkers, trampolinists, BMX bikers, young Chinese girls with diabolos, human wheels, a person who climbs a mountain of chairs, and my personal favorite-The aerial ballet in silk (Which is exactly what it sounds like!) that soars over your head. Between, and sometimes during, the acts you are entertained by four bald “clowns” dressed in white flowing garb whose facial expressions and choreographed movements enhance the performance and bring lots of laughter. The two Emmet Kelly-esque clowns also have small bits which are usually hilarious. From time to time you will get a glimpse of the musicians and soloist elaborately costumed and performing beautiful numbers from somewhere high above the performers on the stage. The stage itself is an engineering marvel. Large building-like structures complete with windows appear from nowhere, performers disappear into the floor, extensive trampoline runners appear and disappear, high wires come and go, a large moon and a cowboy on a horse traverse the rear for who knows what reason, and there is even a miniature train set chugging along the stage floor at one point. You won’t notice it when you attend your first performance, but in subsequent performances you may see that the complex choreography of the action belies an intense focus on the safety of the performers. A gangly trampolinist in tights adds humor to the person climbing chairs, but a closer look reveals that he is the safety net in the event of an accident. His own safety is ensured as he slips under the table when new chairs are piled high. The four clowns in flowing white appear to be augmenting the young Chinese girls doing fantastic feats with the diabolos, but a closer look reveals the extra diabolos hidden behind the fountain ready to be unobtrusively passed from clown to girl in the event of a mistake while a neighboring clown retrieves the errant diabolo in a way that makes the error appear to be a part of the show. I was a theatre major in college, so I am attracted to the theatrical arts. Occasionally, you may encounter a show that breaks new ground. Occasionally you may encounter a show that simply leaves you speechless. And occasionally you may encounter a show that for some unknown reason just tugs on your heart. But to find a show that does all that and more seems miraculous. In a way I can’t explain, this show bypasses your brain, ignores logic, and simply creeps inside your heart helping you to feel more alive. I mentioned at the beginning of the blog that there were only a few theatre pieces, in addition to La Nouba, that had such a profound effect on me. Those would include the first time I experienced the movie Chariots of Fire in 1981 (not coincidentally the same year I won the National Championship in wrestling), the first time I saw the movie An Officer and a Gentleman in 1982, and the first time I saw Les Miserables with the incomparable Colm Wilkinson portraying Jean Valjean at the Kennedy Center in Washington DC in 1987. Don’t miss La Nouba. After the show, I predict you won’t miss the money you had to spend to see it.